Disney Alice in Wonderland pin pins. 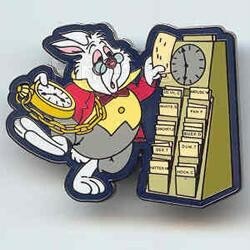 WDW Cast Member Pin Party - Backstage Pass Series (White Rabbit) This limited edition pin released at the WDW Cast Member Pin Party at Mickey's Retreat features White Rabbit from Alice in Wonderland. He is clocking in his timecard at the time clock machine so he won't be late. He is also holding his timepiece. Courtesy of pinpics site.